Do You Have these Annoyances? Before answering the questions above, let's have a look at why there is an ever-increasing demand on AVI video to MPEG conversion on Mac. AVI, abbreviation of Audio Video Interactive, is basically a multimedia container format that was first released by Microsoft in November 1992. It enjoys great fame for its great flexibility and compatibility with a large number of devices and media players. But high versatility does mean omnipotence. Compared with AVI, the major advantage of MPEG file is that it is much smaller for the same quality, supported by Apple products and can be recognized by nearly all DVD players. That is why many Mac users want to convert AVI to MPEG format. Now that people would like to change the format from AVI codec to MPEG for various reasons, AVI to MPEG converter, including the free one, comes into being as a matter of course. Disappointingly, such freeware usually has problems of either disappointed quality or annoying watermark. Worse still, some freeware crashes on macOS. 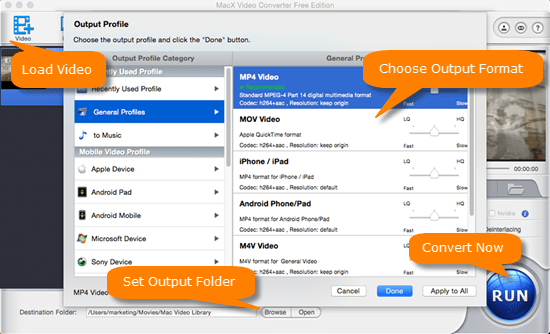 But if you are still racking your brains in trying to free change video format on Mac, you can make all of your worries pass away like a cloud with the assistance of MacX Video Converter Free. Totally free and 100% clean, this program can help you free convert AVI to MPEG on Mac as easy as blowing off dust, while holding the video quality as good as original. It equips itself with GPU HW acceleration and advanced "Safe Mode" function, helping to shorten and smoothen the whole conversion on Mac. Additionally, it works well to transcode video among MP4, HEVC, MKV, M2TS, WMV, FLV, MOV, AVI, etc. with 98% quality kept for free. Convert avi to mpeg, and avi to mp4, mov, H265/HEVC, wmv, 3gp all formats. Compress HD, UHD video, like 4K 2160p to 1080p, H265 to H264, etc. Decode AVI to formats supported by mobiles iPhone iPad Android. Futher edit AVI video like trim/crop video, add watermark & subtitles. World's 1st free avi decoder with advanced GPU HW acceleration tech, 5x faster. Less than 1 min to discern how to change AVI to Mpeg, no guide needed. Free download this free AVI video processing tool, run it and then click the "Add File" button to load the AVI files. Select the target format "to MPEG" button. You can also convert avi to mov, avi to mp4, 3gp and 200 more video files. This Mac media converter also enables you to trim any video segment by simply setting the start time and end time in the preview window or extract favorite MP3 video from video seamlessly without any quality loss. Click the "Browse" button to choose the path to save the avi to mpeg converted files. Click the "RUN" button to start to convert AVI to MPEG on MacBook Pro, iMac 4K/5K for free. Don't be fettered by the old saying that "There is no such thing as a free lunch". If you do need to transcode video from AVI codec to MPEG on Mac, download this app and it will prove itself to be worth your trust. Best-ever AVI video to MPEG decoder to change AVI videos to MPEG, MP4, MOV, 3GP, MKV, FLV 200 more files and vice versa, for playback on media player or mobile device with 5X faster speed (Intel/Nvidia/AMD GPU HW acceleration) & no quality loss.